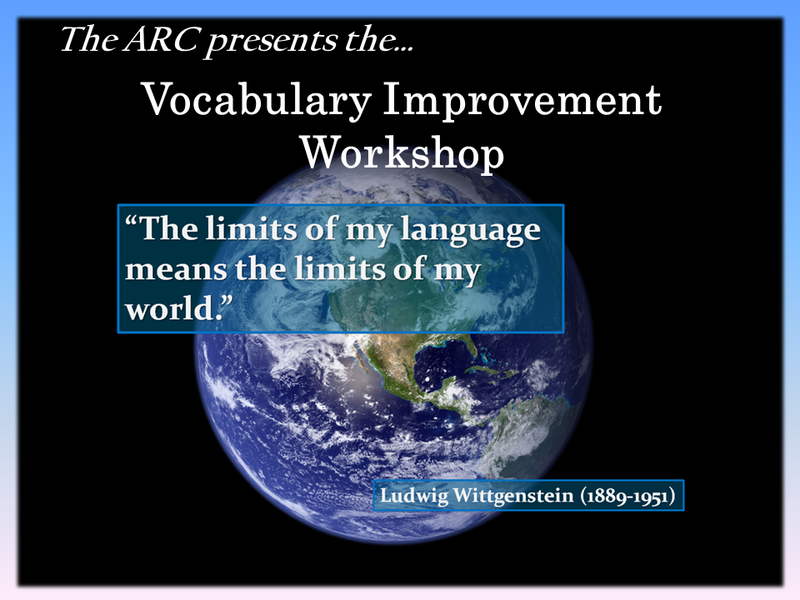 The Vocabulary Improvement Workshop | Save My Reading Life! Language is powerful. It is powerful enough that, if a person finds himself in a place where he cannot use language he will often feel limited and helpless. This is true in every facet of life. That is why knowing how to communicate effectively is key to success in college. For this reason, it is important you learn the language of your courses, called jargon. Jargon is discipline-specific vocabularies you must master to do well in your courses. Some jargon can sound familiar and some can sound very foreign. To maximize your success in college, and later in the workforce, find ways to learn and integrate new jargon into your vocabulary. Previewing is a powerful way to begin to introduce new words into your vocabulary. Previewing is also very simple to do. You simply look over material before you read it and make a point to identify and look up new or unknown words. Titles, Headings, and Subtitles – As you look at each heading, note any unknown words and look them up in the glossary, if necessary. Also make a note of any words that appear multiple times; repetition usually is a sign of importance when it comes to terminology. Objectives and Key Terms – Objectives usually appear before the chapter begins; Key Terms usually appear at the end of each chapter. Focus on these areas because terms that appear in these sections are those that the author feels are most important within the chapter. Another important strategy is to say new words out loud when you encounter them for the first time. There are many words that sound different from how they are spelled. Take for example the word genre. This is word you might encounter in an art, music, history, humanities, or literature textbook. Do you know how this word is pronounced? If you do not know, you may go to class and wonder what your teacher is saying when she says a word that sounds like “jon-ra.” Believe it or not, the word genre sounds like “jon-ra.” If you had not connected the word with the sound, it might lead you to be very confused because you cannot connect the word you see on the page (genre) with the word you hear (“jon-ra”). 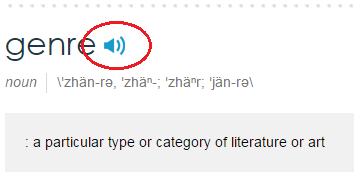 To hear how to pronounce a word, click on the speaker symbol next to the word on the Merriam-Webster site. If you have headphones on, or your speakers turned up, you will hear the word being “spoken” by a voice on the computer. If you’re not sure how to pronounce word, there are many sites online to help you. Merriam-Webster’s Online Dictionary offers a link you can click that allows you to “hear” the word through your computer speakers or headphones. You can also ask your peers, friends, and family to help you pronounce the word. They might know how to say it and you can practice saying it, too. Making this connection between the way a word looks and the the way it sounds can make learning new vocabulary in your class much easier to do. 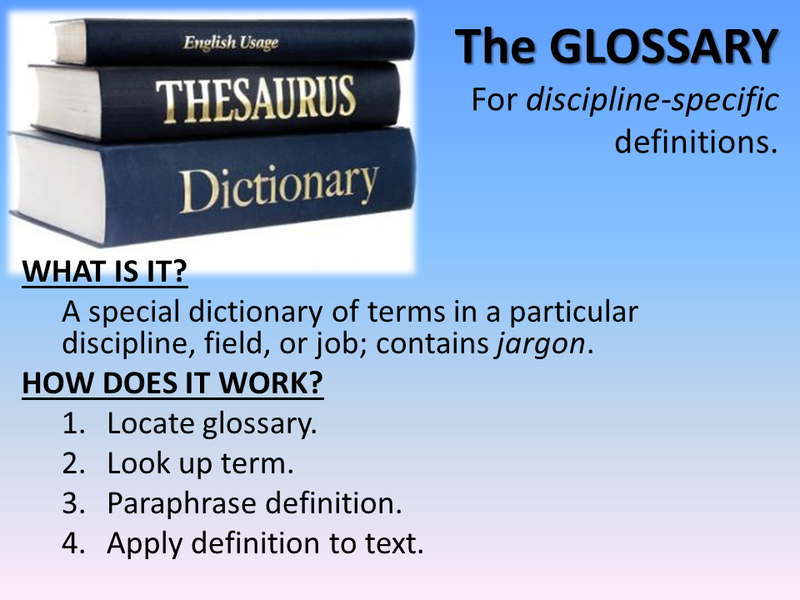 The Glossary – For discipline-specific definitions. The Dictionary – For general definitions. The Thesaurus – To find words with a similar definition. A glossary should be your first stop to finding the definition of a word. 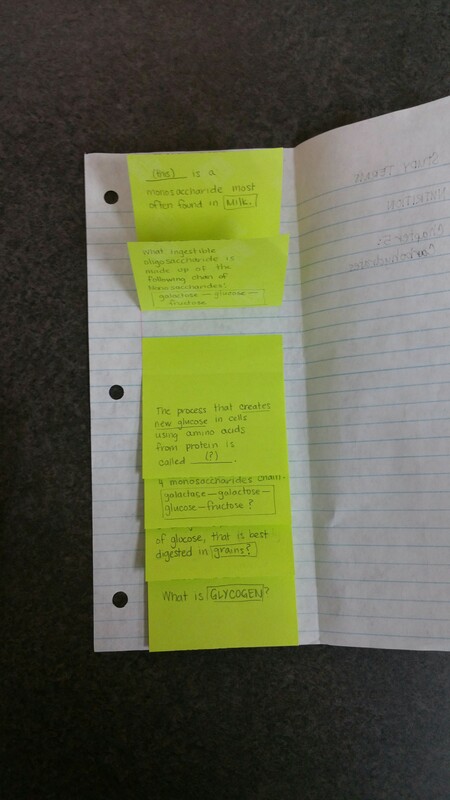 You also want to be sure to use a glossary that is specific to your class, if possible. As you will see in the next slide, if you try to use a glossary from a different course, you run the risk of using a wrong definition if you rely on glossaries from other texts or disciplines. The glossary is a resource the gives a single, very specific definition of a word. The definition of the word is dependent on the discipline or field in which the word is being used; the dictionary contains jargon. Jargon are words and expressions that have a specific meaning within a specialized context. Jargon can make understanding especially difficult if you are unfamiliar with the specialized terms. If you find yourself with a text or class that does not provide a glossary to define terms, ask your professor for a recommendation. Your professor might recommend a handout, book, or website to help you get specialized definitions. If that is not possible, you can often find specialized glossaries online like the American Psychological Association’s Glossary of Psychological Terms, the Oxford Reference Dictionary of Sociology, or the Oxford Reference Dictionary of Literary Terms. When using an outside glossary, use caution that the definitions provided match the context of your class. If you are not sure, be sure to ask your professor. Glossaries are usually found in the back of your textbooks. If you cannot find one that suits your purpose, you may consider making one of your own in your notebook. Glossaries are almost always organized alphabetically, like a dictionary. To be sure you understand what the word means, put the definition in words that are simple and clear. If you cannot do this, make a note of some questions that might help you figure it out. Apply the definition to your text. Once you know what the definition is, take your paraphrase and apply it to the term in the book. 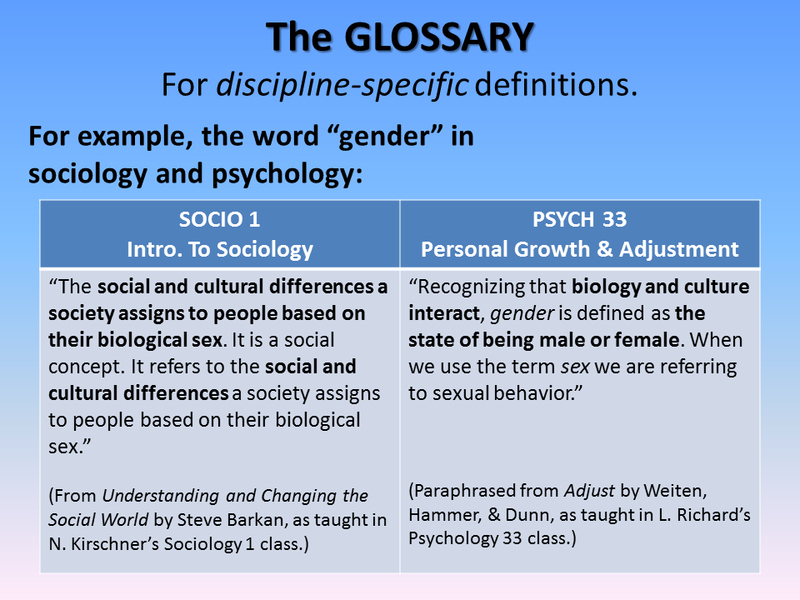 These definitions are of the word gender; and this word appears in both sociology, which is where the first definition appears, and in psychology, which is the second definition. If you use one definition you learned in sociology in your psych class, then you will be confused and you will most likely lose points on exams and quizzes. Be sure that you always refer to a specialized glossary first, even if you believe you may know the answer already. The dictionary should be your second choice for finding the meaning of unknown words. While a glossary provides only one definition, a dictionary will provide several, if not dozens. 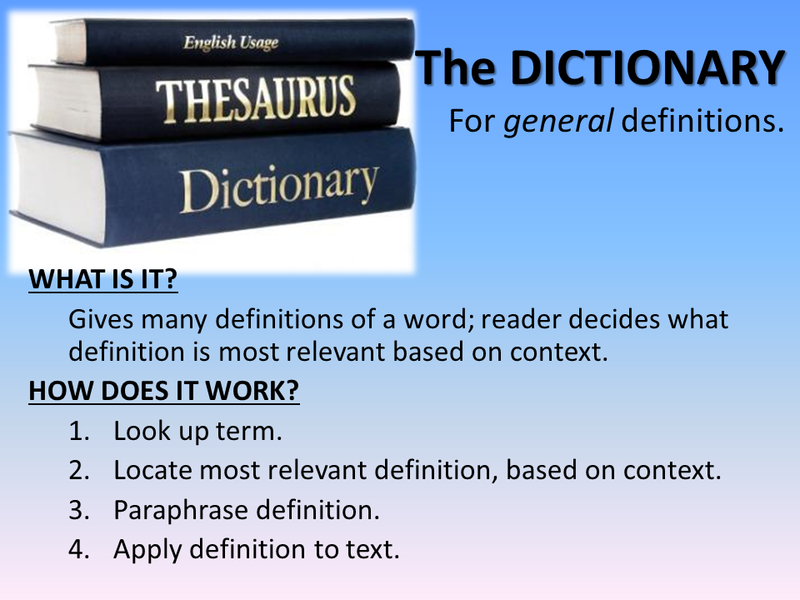 When using the dictionary, it is the responsibility of the reader to decide what definition is most relevant based on the context of the word in the sentence. Paper dictionaries are fine but if one is not available use an online dictionary. Dictionaries, like glossaries, are organized alphabetically; if using an online dictionary, then just find the search box and type your word in and click search. Locate the most relevant definition, based on context. This is the hard part of using the dictionary: you have to examine each definition given to determine which one works best for your purpose. I will cover this more in the next few slides. Apply the definition to the text. Take the word mole. 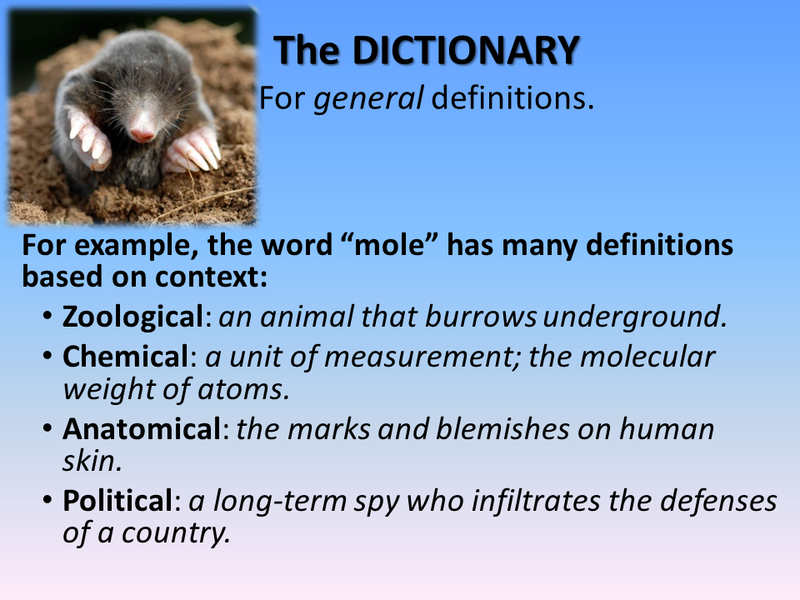 If you look at a dictionary for the definition of the word mole you will find that there are six different definitions of the word, and each definition is completely different. On the slide above, you will see I pulled out the four that are most related to education: zoology, chemistry, anatomy, and political science. How could you determine which definition to use? Take each definition given by the dictionary and paraphrase it in the most basic terms, then insert those definitions into the original sentence. You will probably find that any definition that does not fit the context will become clear. 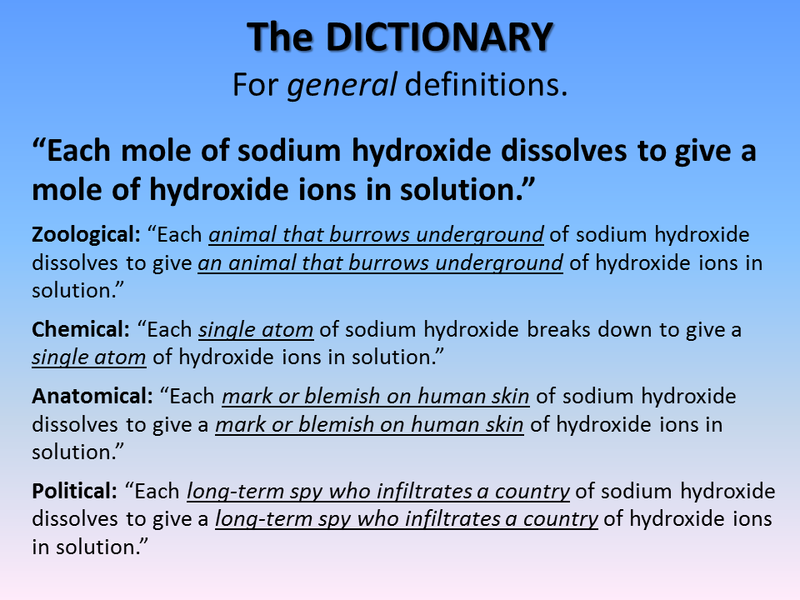 Zoological: “Each animal that burrows underground of sodium hydroxide dissolves to give an animal that burrows underground of hydroxide ions in solution. Clearly, the chemical definition is the one that is intended by the context of this sentence. However, you can also see that, had you chosen the first definition the dictionary presented, using the wrong definition can make understanding near impossible. From the genius(es) at Buttersafe.com. Do not use the thesaurus to make your writing “sound” smarter. A thesaurus is a great tool to learn new words but not in the way you suspect. Use it to search for unknown words and find words that you understand already. 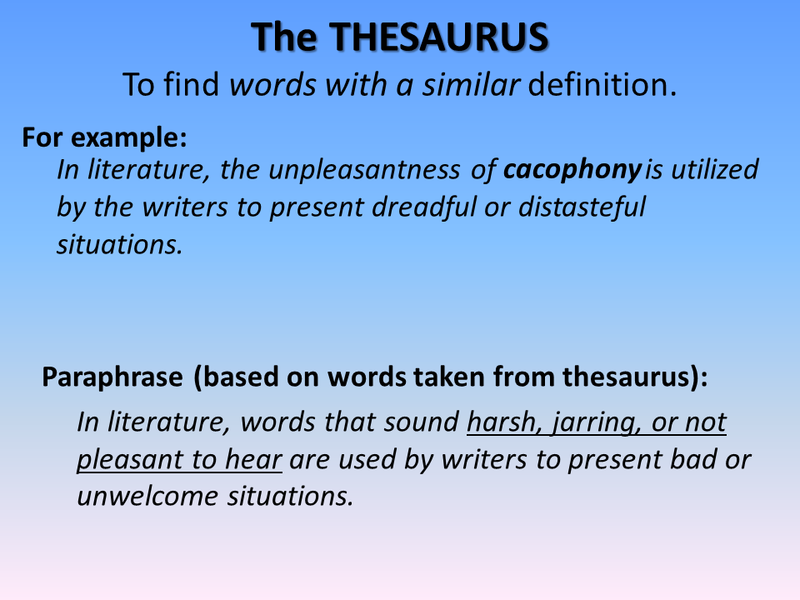 A thesaurus is a tool best used to paraphrase. Of course you can get a paper one, or you can use sites like Thesaurus.com. Look up the unknown or confusing term. 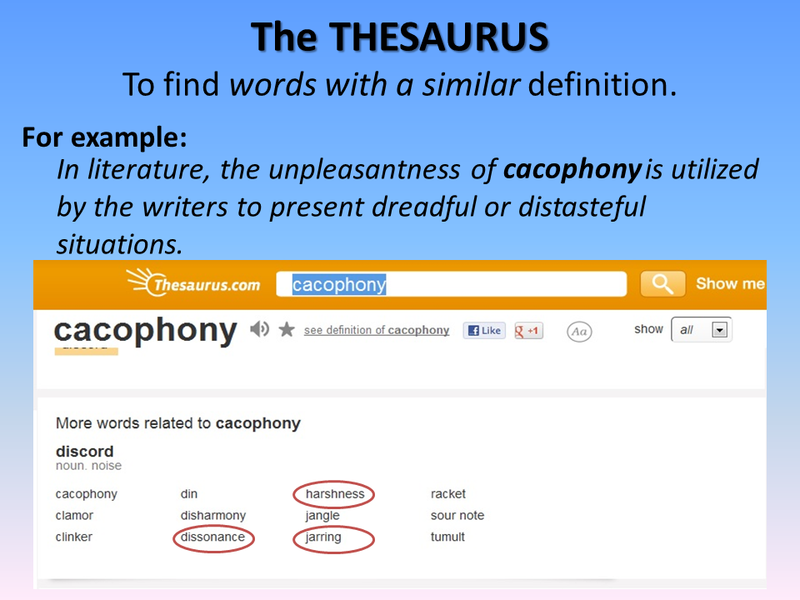 A thesaurus is organized alphabetically or you can type the word into the search box if using a website. Identify alternate, more familiar word(s) that help you understand the original word. Select a few words from the list of given terms that you know or are very familiar with. Paraphrase the definition of the unknown words using the more familiar words. Using the known words, create a new sentence (paraphrase) so you can understand what the original sentence is saying. because those are the words most familiar to me. You might select other words from the list you are more familiar with. This sentence is much easier to understand! Another way to improve your vocabulary is to learn affixes and roots. Affixes include prefixes and suffixes and are added to root words to change their meanings or parts of speech. Prefixes in particular can be useful in understanding words. 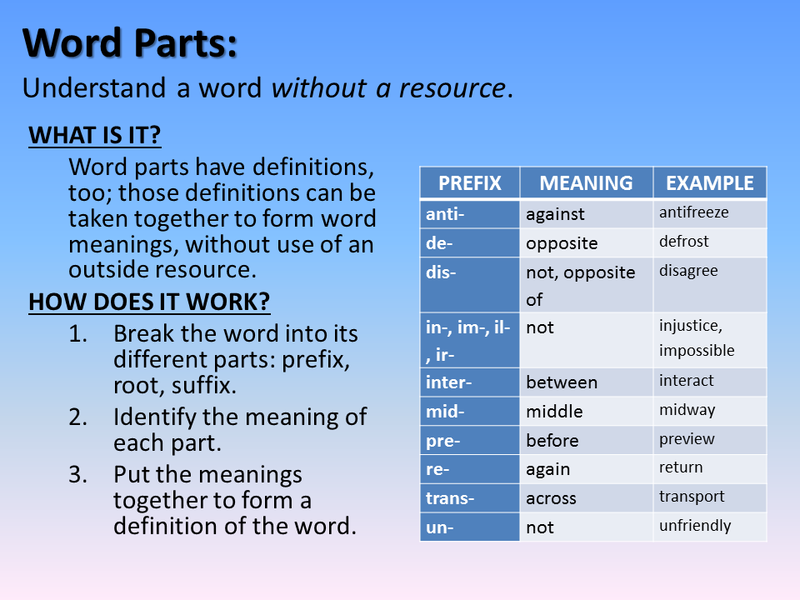 In fact, there are nine major prefixes that cover 76% of all prefixed words (Roe & Smith, 2012, p. 175) so learning these nine prefixes can unlock a great deal of meaning. Word prefixes that are most useful to college students. Prefixes and roots are especially useful to students who are interested in studying sciences–especially nursing students or aspiring doctors. 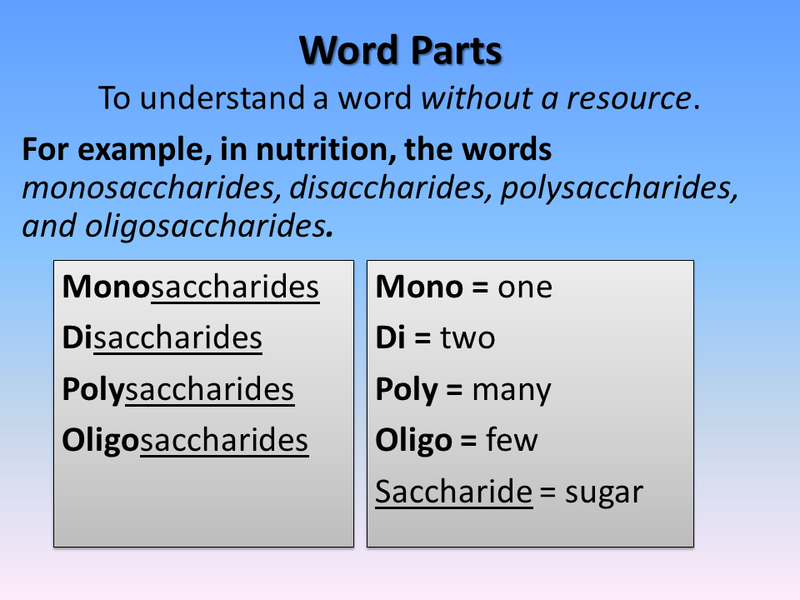 A great deal of biology, anatomy, and chemistry consists of prefixes that identify quantity (mono-, di-, pan-, etc. ), location in the body (cervico-, chole-, boncho-, etc. ), or position (circum-, co-, para-, etc.). Learning common prefixes is essential to success in studying medicine or nursing. With this knowledge, these once intimidating words now seem accessible and much easier to learn. Also, once you learn these four prefixes, you also learn a number of other words that include these prefixes. Words like monotheism, dilemma, polyglot, and oligospermia all seem much more accessible even if you do not yet know what the root word means. 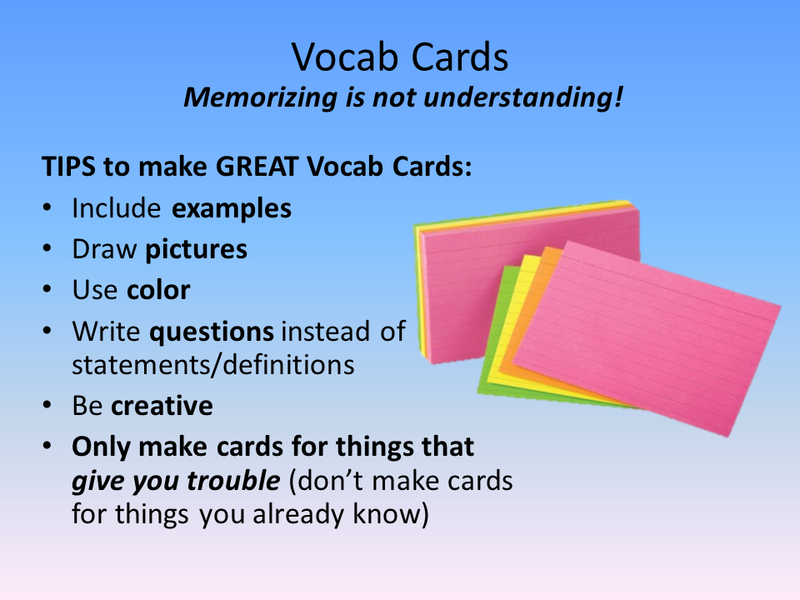 Slide 11: Vocab Cards – Memorizing is not understanding! When it comes to making flash cards, I must admit, I am biased: I have always disliked making them. This is why I call my cards vocab cards instead of flashcards because these cards I have found especially helpful, unlike flashcards which I have found to be a waste. My beef with flashcards is that they are often to taught one way (term on the front & definition on the back), and the definition is almost always copied out of a textbook with very little thought. Furthermore, students (like me) would make dozens, if not hundreds, of these cards and everything about them from making them to studying them, became completely impractical. Examples can go a long way to help give context to material. You can add the example as an extra feature to your card, like dividing the card and putting the definition on one side and an example on the other, with the term on the opposite side. Especially useful for foreign languages or sciences, drawing a picture of a word is especially helpful. For example, you might put a word from the foreign language on one side, and draw a picture on the other. Or, you might recreate a picture from your biology book on one side, then put the term on the other. Adding a touch of color to your cards can give them personality! If you are a person who enjoys pictures and visuals, drawing and then coloring your pictures can help you make connections and help long-term memory. Even just color coding your cards (green for one subject, pink for another; or green for one chapter, pink for another chapter) can help improve memory. Write questions instead of statements or definitions. 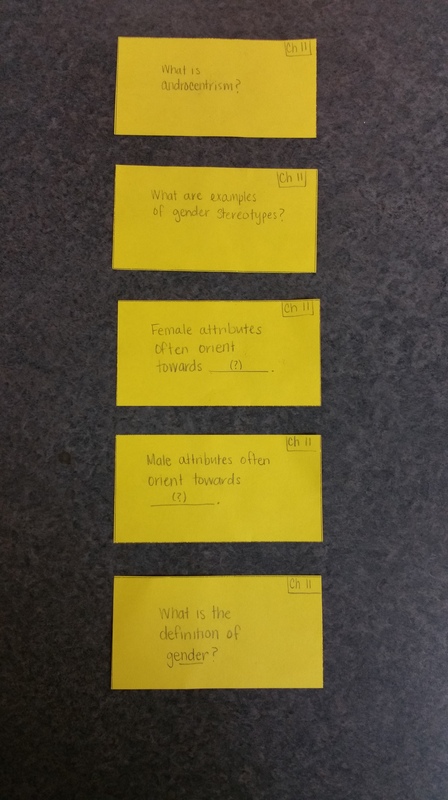 Instead of just writing statements or paraphrasing definitions, think up questions that might show up on an exam and put those on your cards instead. Then you can use your cards for a jeopardy-style game and quiz yourself or have someone else quiz you. This is much more fun and useful than simply trying to memorize. There is no one right way to make vocab cards! Try new ways to make them and make a variety of cards. Most importantly, make cards that work for YOU. Only make cards for things you do not know; do not make cards for words you already know. explain why the word is important in the context of your course. Improving vocabulary is a lifelong process. Even when you finish school, you will need to find ways to help you learn new words on the job. Learning strategies now to help you do that will only help you in the job market. The thing to remember about vocab or flash cards is that they only work if you study them. Do not make so many cards that you do not have time to back and review them often. 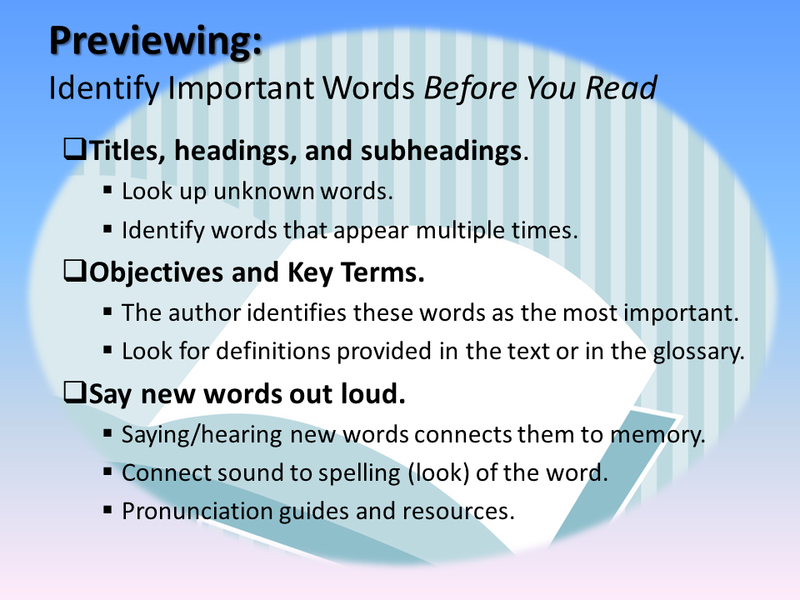 If you find yourself in a class with many new words, you might consider making vocab cards as you go through the class–perhaps even daily–so you can continue to review them long-term. Psychology Vocab Cards (Front Side). Note: I put the chapter number on the top right corner so I can go back to the chapter if necessary. There are fill-in-the-blank style questions and open-ended questions. 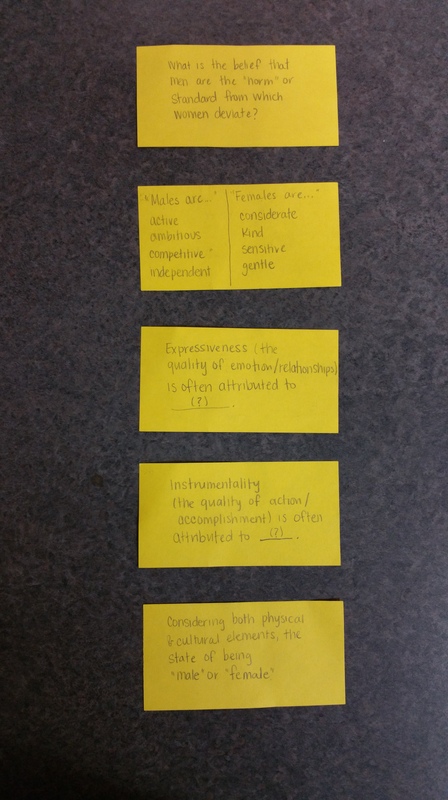 Psychology Vocab Cards (Back Side). The backs of the cards have questions, too. See that the answers for one side are found in the questions on the opposite side. These cards are very challenging to make but encourage critical thinking about the material and trying to think of ways your instructor might ask about material on an exam. I had a student a few semesters ago who refused to make vocab cards because she would always lose them. I encouraged her to be creative: she did not have to use “cards” if she did not want to but she had to come up with another way to learn the vocab. This was her solution: flippers. Flippers are best when made with Super Sticky Post-It Notes because the regular ones fall off pretty fast. 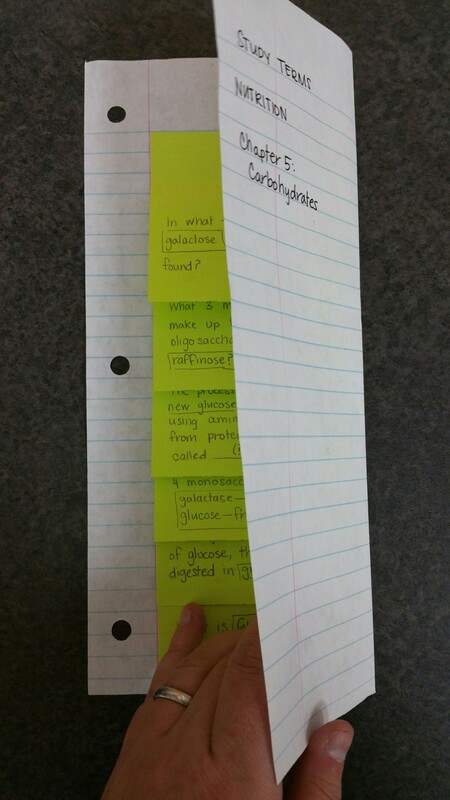 The regular-sized notes work great for half-sheet of paper and you can fold the notes up once you stick them to the page. 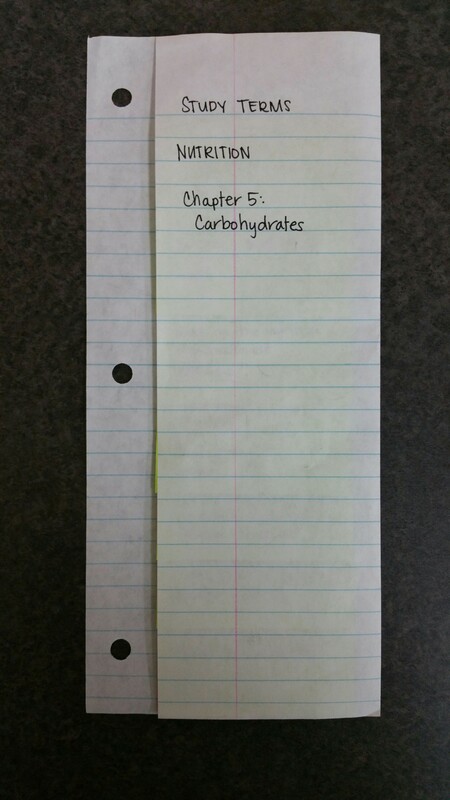 Label your page so you can remember what class/chapter you made them for. Pingback: My beef with “flashcards.” | Save My Reading Life! Pingback: Test Preparation Workshop | Save My Reading Life!